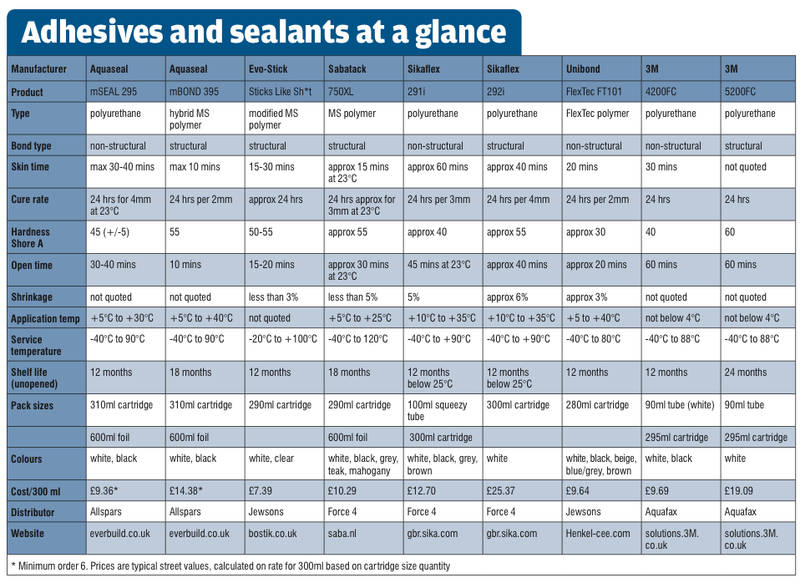 Which adhesive sealant is best? When it comes to sticking two bits of anything together, I tend to be a belt-and-braces person – or should that be a nut, bolt and glue person? However, times have changed and so have adhesives. Increasingly, adhesives are powerful enough to do the job by themselves: we have adhesives to hold our car windscreens in place, modern aircraft use adhesives extensively for body parts and even the latest lifeboats rely entirely on adhesives to bond the rubbing strip to the hull. There are a variety of adhesive products on the market, some designated specifically for the marine market and many more available from local DIY stores or builders’ merchants. The choice of specialist marine adhesives alone is so great that chandlers don’t tend to carry the full range on their shelves. A visit to my local chandlery revealed only two products in stock on my shopping list of six marine products from three manufacturers (Sika, Aquaseal and 3M), but I did find another product, by Saba, that I’d never heard of. A similar visit to a national chain of builders’ merchants enabled me to source one product from the Bostik/Evo-Stik manufacturer and identify products from UniBond, but still failed to provide me with two other products from my shopping list. On boats, we use adhesives and sealants. Sealants do not possess great bonding strength. Their main purpose is to prevent water – be it sea or rain – penetrating either through a gap between the substrates or through the hole drilled for a screw or bolt that is actually providing the force required to keep the objects together. Typically, these could be deck fittings such as cleats, winches, rope clutches, hatches and windows. Adhesives, meanwhile, can be used to complement screw or bolt fastenings, or to carry the load without the need to penetrate the deck or coachroof with extra fixings. The Sikaflex brand will be familiar to most British practical boat owners. On its website Sika lists seven products for marine applications: deck caulking, sealing compound, two grades of adhesive (strong and high-strength), direct glazing adhesive, spreadable adhesive for panels and sheets, and finally a sealing/bonding adhesive where flame retardation is required. If you have read Richard Hare’s PBO articles on wood adhesives, you’ll know that two categories of adhesive are structural and non-structural: these tie in with Sikaflex’s strong and high-strength grades. Don’t use the high-strength structural if you want to get the fitting off the deck in a few years time: the danger is that you may find the GRP or gel coat substrate becoming the loser in that fight. Non-structural adhesive is a lower strength for use where dismantling is required. Product data sheets are available for each of the adhesives we tested: these varied in the amount of additional information they presented. The 3M data sheets were the most helpful. Your supplier should be able to provide you with the relevant data and safety sheets. What are we looking for in an adhesive? This will vary with the intended use, and is very much a case of horses for courses: you would be lucky to find a product that meets all needs. For example, Sika specify different adhesives for organic glass and mineral glass. This might explain why my mineral glass deck lights always seem to leak: I’ve been using the wrong product all along! We decided to focus this test on non-wood products, concentrating upon sticking aluminium, steel, acrylic and glassfibre. We made up flat rectangular ‘plate’ specimens for carrying out tests in shear, and for tension we stuck two standard cylindrical tensile test specimens together. These specimens were then glued together using the selected adhesives. Care was taken to clean the surfaces to ensure there was no dust, grease, wax or other contaminants present. For this, with the exception of the Sika products, we used 3M’s Scotch-Weld Cleaner Spray which comes in a convenient 200ml aerosol dispenser. For the Sika products we used their Sika Cleaner-205. For the specimens in shear we placed a washer of 1.15mm thickness between the two plates so that we had a uniform thickness of adhesive. This ‘shim’ is recommended to ensure that the adhesive or sealant is not squeezed out if fixing screws or bolts are pulled up tight. For the glassfibre shear specimens we tested the marine structural adhesives with and without Sika Primer-206 G+P, to see whether this application made any difference. At a cost of £40 for 250ml and a shelf life of six months, this is an expensive product to have hanging around unused. Aquaseal recommend a similar product called Marine Primer No 20, sold in 500ml tins, for plastic, metals and other non-porous substrates. 3M recommend Scotch Weld Structural Adhesive Primer EC-1945 B/A. For all the specimens, the only initial surface preparation we did was to clean the contact surfaces. However, for comparison purposes, we also tried one specimen in the shear test with no spacer, forcing the two surfaces together with finger pressure. Finally, we tested all our materials with one non-structural adhesive – Aquaseal mSEAL 295 – with all the contact surfaces abraded with 400-grit wet and dry paper before cleaning. All specimens were tested on a Hounsfield (Monsanto) tensile testing machine in the materials laboratory at Southampton Solent University. Adhesive failure: The adhesive/sealant releases from the substrate. Cohesive failure: The adhesive/sealant fails before the adhesive releases from the substrate – this usually gives a higher strength value than through adhesive failure. Curing: The process of the adhesive/sealant solidifying. Shore A hardness: Hardness tests involve pushing an object, eg a steel ball, against the material’s surface with a specified force. The amount of penetration gives a measure of the hardness. The Shore A scale is used to test rubber-type compounds. The readings range from 30 to 95 points. A car tyre typically has a value of 70. Substrate: The surface material upon which the adhesive/sealant is applied to form a bond or joint. Stress: A comparative measure of the strength of a material. The maximum force is divided by the original cross-sectional area that is subjected to the force, giving load per unit area. Shear stress: The force is parallel to the area under load. Tensile stress: The force is perpendicular to the cross-sectional area under load. This is a universal polyurethane adhesive for marine sealing and non-structural bonding where a permanently elastic, vibration-damping seal is required: it can be used as an adhesive in limited stress applications. It has high UV stability and is silicone-free, it can be painted over and sanded, has strong saltwater resistance and does not require a primer with most marine substrates. The sealant performed about averagely for the non-structural adhesives. Failure for the metals was adhesive, while the acrylic and glassfibre were 50/50 cohesive/adhesive. We also tested the shear specimens with mSEAL 295 after first abrading them with 400-grit wet and dry. The results showed a variable improvement in grip (see chart), with the aluminium showing the biggest gain from abrasion before application. This is a high-strength, marine-grade adhesive based on advanced hybrid MS polymer technology, specifically designed for structural and dynamically stressed bonding applications in the boatbuilding and maintenance industries. It offers high initial grab and anti-vibration bonding and bedding properties. It can be applied to wet or humid surfaces, has high UV and saltwater resistance, is virtually odourless and can be painted over. ON TEST This gave better-than-average performance for the glassfibre, acrylic and aluminium, but showed reduced adhesion to steel. All the failures for the shear test were cohesive. Obtainable from builders’ merchants, this is a single-component, moisture-curing, modified silane (MS) polymer-based sealant. It is claimed to bond damp surfaces and even to be useable under water! It has low odour and cures to form a hard elastic rubber, with almost no shrinkage. It is a low-hazard product and contains no water or solvent. When fully cured, it may be painted over with most types of paint. It is mould-resistant and sticks to most surfaces including wood, glass, metals, rigid PVC, glassfibre and foam polystyrene. It can be used for interior and external applications. ON TEST This performed consistently with all four materials, outperforming the UniBond Flextec but with a lower performance than the marine structural adhesives. Failure in the shear test was cohesive, except with the steel where it was an adhesive failure. This is a one-component, elastic, humidity-curing, MS polymer-based structural adhesive with extended skin time. Its primary use is bonding: secondary use is sealing seams, overlaps and joints. It has a medium viscosity, a high modulus of elasticity and extended open time. It is UV-stable, has high temperature resistance, can be painted wet on wet and is suitable for interior and exterior use. ON TEST This performed overall second best on the shear test, with best results for the aluminium and acrylic, but gave the worst performance for the glassfibre compared to the other structural adhesives. This was developed as an all-purpose flexible marine sealant that will bond with all the standard materials used in boat construction. It is a non-structural adhesive, ie light duty, one-component polyurethane, with high elasticity and resistance to weathering, seawater and UV radiation. It has excellent gap-filling capability and can be painted over and sanded, for use above or below the waterline. 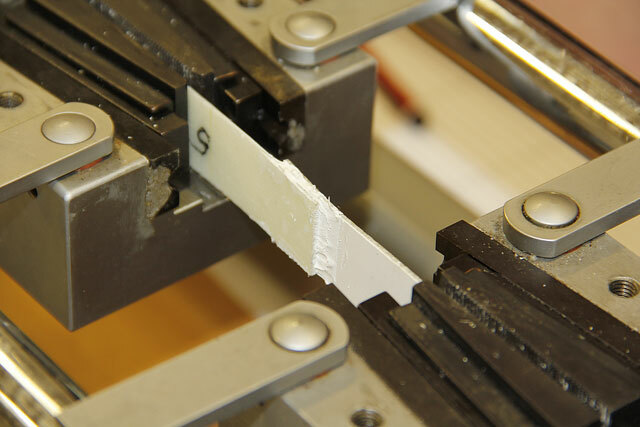 ON TEST On the shear test, the seal did not adhere to one face of the aluminium, steel or acrylic but bonded well to the glassfibre, and failed through shearing the sealant. This was the weakest on test. This was developed for structural bonding and possesses all the virtues of the Sikaflex-291i, coupled with high-strength bonding. It has excellent shock-absorbing and vibration-damping properties, coupled with high elasticity and resistance to weathering, seawater and UV radiation. It has excellent gap-filling capability and can be painted over and sanded, for use above or below the waterline. ON TEST This was one of the best products on test, with good adhesive properties with our materials. However, there was partial failure of the bond with the substrate for all our specimens. We also tested the glassfibre with Sika Primer 210T: this outperformed the non-primed glassfibre, and there was a complete bond with both surfaces. This is a popular builders’ merchant product, a one-part, moisture-curing polymer suitable for a wide range of elastic sealing and non-structural bonding operations. It will bond to a wide range of materials, has high elasticity, primerless adhesion, good UV, weather and ageing resistance and good ‘gunnability’ at low temperatures. It can be painted after full curing, but is not suitable for joints with water pressure or permanent water immersion. ON TEST This showed about average shear strength for a non-structural adhesive, with good adhesion to all the substrates except the steel, where there was 50% peel. This is a fast-curing, one-part polyurethane that reacts with moisture to give non-structural (medium-strength) bonds to wood, gel coat and glassfibre. It forms a watertight, weather-resistant seal on joints and boat hardware above and below the waterline. Its flexibility allows for the dissipation of stress caused by shock loading, vibration or shrinkage of the substrates. A primer (Scotch-Weld Primer EC-1945B/A) may be necessary with certain metals. ON TEST The adhesive’s performance was about average for the non-structural adhesives. Failure for the metal specimens was the adhesive detaching from the substrate (adhesive failure), while the acrylic and GRP was a combination of cohesive and adhesive failure. This is a fast-cure (one-day), one-component polyurethane structural adhesive/sealant, suitable for above or below the waterline. It stays flexible, allowing for structural movement: stress caused by shock, vibration, swelling or shrinking is effectively absorbed. It is suitable for sticking a glassfibre deck to a glassfibre hull, wood to glassfibre, portholes and deck fittings, hull seams above and below the waterline, centreboard trunk joints between struts and planking, stern joints and deck housing. 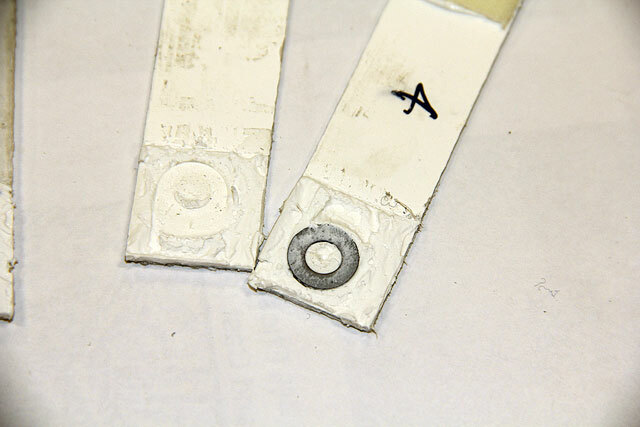 ON TEST The aluminium and steel specimens failed through cohesive bonding, the acrylic and glassfibre through a combination of cohesive and adhesive failure. The adhesive did better than the others with the glassfibre. For the primed specimen, the adhesive stuck to the substrate and the adhesive failed, but at a lower level of stress. 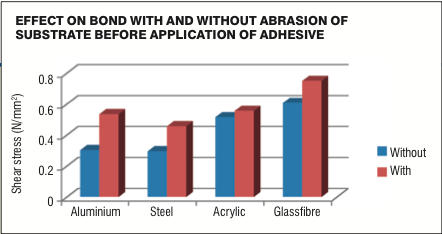 There is a big difference in strength between the non-structural and structural adhesives. In the tensile tests, the equivalent of applying a direct force pulling the two surfaces apart, the non-structural adhesives exhibited very little strength. The issue was very much the bond between the adhesive and the surface in contact, but this property is desirable if disassembly of the bonded parts is required at some point. It should be noted that our ‘best on test’ awards have been selected purely by bond strength, as our test does not indicate a product’s resistance to water ingress. However, it does show elasticity, suggesting that the Unibond Flextec FT101, Sikaflex-291i and 3M 4200FC all provide a bond which should put up with a fair amount of abuse while still being possible to release if required. The structural adhesives were much stronger, but their performance was below that specified in their product data sheets. This is because the manufacturers test just the adhesive itself; hence the failure is always cohesive. For the shear tests, most of the metal specimens failed, with the adhesive releasing from the substrate. The acrylic and GRP fared much better, with most of the structural adhesives failing in a cohesive mode. The use of the spacer improved the strength of the bond. Surface abrasion also improved the bond between the adhesive and the substrate for all the specimens. The use of the Sika primer improved the strength of the Sikaflex-292i but weakened the Aquaseal mBOND 395 and the 3M 5200, so the lesson here is to use the product specified by the manufacturer. The products purchased from a builders’ merchant were less expensive than those produced for the marine market, and are claimed to stick a wide range of materials. The Bostik/Evo-Stik product performed better than the UniBond but wasn’t as strong as the marine structural adhesives. It’s a good all-rounder though, and is cheap and readily available. Getting the right product for a specific application can be a problem as chandlers only stock the most popular sealants and adhesives and are sometimes unable to get hold of single cartridges. Similarly, they often don’t stock primers as these have both a limited demand and a short shelf life. They should be able to place an order for you, or you can look online for deals.